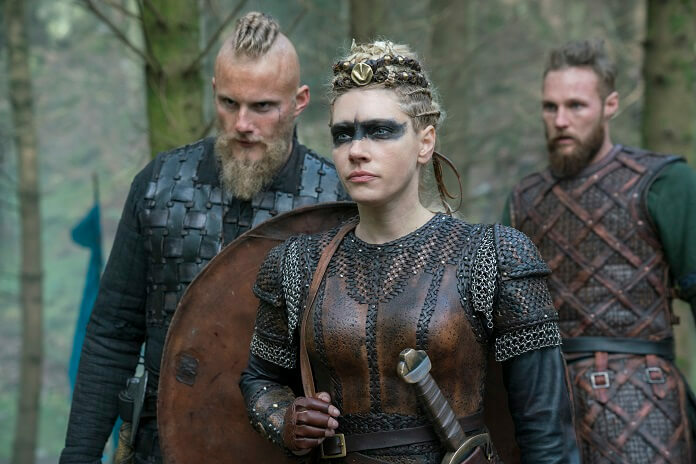 History is once again bringing the cast of the critically acclaimed dramatic series Vikings to the San Diego Comic Con, with series stars Katheryn Winnick, Alexander Ludwig, Clive Standen, Alex Hogh Andersen, and Georgia Hirst expected to attend. The cast will be joined by series creator Michael Hirst to talk about what’s to come in the second half of season five. In addition, History’s new UFO series Project Blue Book will be making its Comic Con debut with a panel and a special interactive Project Blue Book Headquarters set up outside of the Convention Center. Cast members Aidan Gillen, Michael Malarkey, Neal McDonough, and Laura Mennell will be on hand to promote the series’ first season. The cast of History’s hit drama series Vikings, including Katheryn Winnick (“Lagertha”), Clive Standen (“Rollo”), Alexander Ludwig (“Bjorn”), Alex Høgh Andersen (“Ivar the Boneless”), Georgia Hirst (“Torvi”) and creator/writer, Michael Hirst, will get fans excited about the upcoming midseason premiere by discussing last season’s startling alliances, deaths and unbelievable betrayals as the Vikings fight to rule the world. An exclusive mid-season five sneak peek will be revealed. Only the Seer knows what lies ahead in the upcoming season of History’s Vikings and this year at San Diego Comic-Con, fans have the opportunity to enter his lair and consult him about their own future in a hyper-shareable photo prophecy. Join us and see what the future has in store for you! History’s upcoming new drama series Project Blue Book is inspired by the work of Dr. J Allen Hynek and the true, top secret investigations into Unidentified Flying Objects (UFOs) and related phenomena conducted by the United States Air Force from 1952-1969. Series stars Aidan Gillen (Game of Thrones), Michael Malarkey (The Vampire Diaries), Neal McDonough (Arrow, Legends of Tomorrow) and Laura Mennell (Alphas, Watchmen), along with producers, will share details about what’s to come in the new series and reveal a sneak peek of the first season. Custom, limited edition Project Blue Book comic books will be given to select fans who visit the Vikings convention center booth and the Project Blue Book Headquarters activation on the Petco Parking Lot. In this exclusive comic book for SDCC, characters Dr. Allen Hynek and Captain Michael Quinn investigate real life Project Blue Book case #1972: The Pittsburg Kansas UFO encounter and interview William Squyres, a radio station musician who claims he saw a low-hovering object with clearly-defined windows and shadowy figures who may or may not have been human.